Sigita is a Controller for Galapagos Partners, L.P. Sigita has 10 years of experience managing commercial and residential real estate portfolios. Previously she was Controller for BDG, L.P. a commercial real estate development company. While at BDG, she oversaw accounting for a portfolio of more than 30 partnerships representing over 3000 housing units. Previous to BDG, Sigita was a Senior Accountant with Weingarten Realty Investors, a public Real Estate Investment Trust. Sigita earned a BA in Accounting from Monroe College in New York. She is also a CPA licensed in the state of Texas. 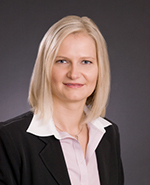 A native Lithuanian, Sigita now lives in Houston with her husband and her son.